**Winner is #68 Pascha Dudley~ Congratulations! Hey guys! I am so thrilled to have been given the opportunity to review a couple of the Klutz Books for kids. They are truly fun and entertaining and I love the fact that they allow kids to use their imaginations and creativity through art. I received the Window Art Classic and Capsters books and they are amazing! 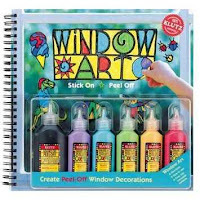 The Window Art Classic book features the neatest ready-to-trace designs using window paint. When your artwork is complete they can be displayed on windows, mirrors, glass surfaces and more. I know my teenagers would love to create their own mirror art to decorate their rooms and bathrooms. 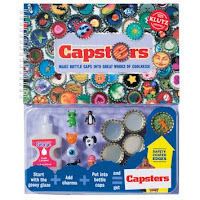 The Capsters book turns bottle caps into great works of coolness! All you do is add one of the over 300 punch-outs (included) and any gem, charms or knick-knacks you can find that will fit in bottle caps and add the gooey glaze. The result is cute little pieces of art that kids can give to friends and family by personalizing it! I am truly loving this idea for kids instead of video games or traditional toys. I know this will bring hours of creative fun and makes a fantastic holiday gift! A couple other Klutz books include the Headband and Hairstyles (make your own hair accessories) and also the Klutz Book of Paper Airplanes. Right now through December 17, 2010 Momfiles readers can get 25% off a $50 or more purchase at Klutz.com by using coupon code KZ25. Offers cannot be combined. Code expires December 17th. How would you like to win ALL 4 of these awesome books? Here is how to enter: *Mandatory: Let us know which one of these books you would love to have and why or share who you would give this prize to. ~ Tweet this giveaway (once per day)- Win a HUGE Klutz Books Holiday prize pack #giveaway @momfiles valued at $75! http://tinyurl.com/357m4e6 Perfect for gift giving! This contest is open to US residents only and will end on December 3, 2010 at 9:00 pm EST. Please leave a visible email address if you do not have a Blogger profile. Winner will be chosen via random.org and will be emailed. Good luck to everyone! Disclosure: I received products only as compensation for my post and hosting giveaway. All opinions are 100% my own. They all look like a lot of fun. The Capsters kit looks super cool. A very unique and fun thing for kids to do. My kids are into crafting and stuff and would really enjoy anyone of the kits. I follow you on Twitter (mnsteph). My daughter would love the window art book! I'd give this to my son and daughter. The window art book sounds like so much fun. My son would love it. OMGosh, I would totally LOVE to win these books. They would have to be a family gift because I would love the hairband one and Joey would totally adore the bottle cap one. I like Klutz books on facebook. I follow Momfiles on twitter. I have the momfiles button in my button gallery. The Capsters book & the window kit look like lots of fun that all my kids would love. The airplane book my oldest son would really love. The Headbands & hairstyles I would give to my niece. My kids would love all of these books, but the headbands book would be so fun for my daughter. I would love to share this with her as a Christmas present. She just got her ears pierced and is loving wearing headbands to show them off. My daughter is really getting into new hairstyles. I think she would especially like the Headbands & Hairstyles book. I have two nieces and two nephews. These would be great gifts for them! I think my favorite would be the paper airplanes, because there are so many useless memos that come through! I would give this to my daughter and her favorite would be the Headbands & Hairstyles book. I like Momfiles and Klutz books on Facebook. I would give this to my youngest daughter who loves arts and crafts. My nephew is always asking me to make paper airplanes for him, and I know exactly one way to do it: that book would be fabulous! Headbands! My daughters would love this book! My son would like the Capsters. They all look interesting, but I'd especially like to give the Headbands & Hairstyles book to my young cousin and the Paper Airplane book to her twin brother! I would love to have Capsters for the girls that I babysit! The book looks like it has so many possibilities and is possible to continue making the crafts even after you use up the included supplies. I also love magnets so having capster magnets for the fridge would be great! Thanks for the great giveaway! I'd love to have the Airplane one to give my brother for Christmas. I would buy the Capster's book for my middle daughter. Those are very trendy where we live now! The Capsters looks really cool! I think both my son and I would have lots of fun with that one. 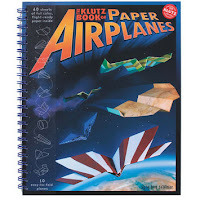 I would love the Paper Airplane book. 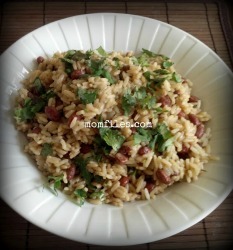 I have always loved to make them! I would give the others to my grandchildren. I'd love to have all four to use in my classroom as rainy day activities for kids who stay in at recess! I would love to have the Window Art one - I think both of my kids would really love it! I would give these to all 4 of my kids.I know my oldest son would love the paper airplane moor the most.I really like the capsters one.Thanks! I like the Capsters for my daughter. I think she and I would enjoy making them together. 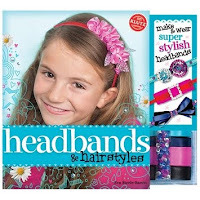 I would like to have the "Headbands & Hairstyles" book for my 7 year old daughter. She would truly enjoy making headbands. I would give Headbands and Hairstyles to my seven year old. 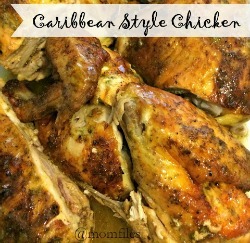 I'd gift this to my twin boys for Christmas! I'd love to check out the capsters book -- that looks really fascinating! And I have four kids, so each would be getting one of these books. I follow you on GFC. Thanks for the opportunity to win! I would give these to my friend's daughter! They don't have money for Christmas, so this would be great! I would split this awesome prize between my kids and their cousins for christmas, something for everyone! I would like to have the paper airplanes most and share with our son. I would like the window art for my daughter. She would love it.